COLLABORATION CELEBRATION! This one goes out to all of our sellers! We’d like to introduce the very first collaboration program which will finally unite designers and developers! It’s called JOINT FORCES. You Programming Ninjas and Design Rockstars have been clamoring for a way to collaborate and put out the hottest designs built on the best platforms. 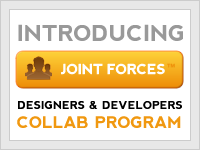 WE LISTENED and starting today JOINT FORCES allows you to COLLABORATE with your favorite designer or programmer to offer the best solutions to the MOJO Nation. And the really cool thing is that MOJO takes care of all the logistics for a seamless allocation that is defined by you and your joint development partner. You and your partner control the process and MOJO makes it easy! 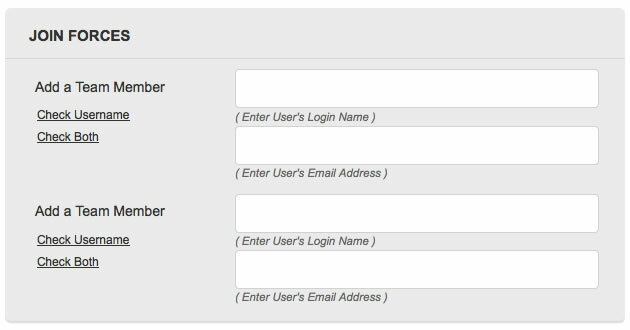 After signing into your account, you will notice a new upload form that has been built custom for each category. Within each category you will see an area near the bottom of the form where you can “Join Forces”. The Joint Forces area has two required fields: (1) Your partners USERNAME and (2) their registered email. Something important to remember, the account that uploads the item is the manager of the partnership of that item. Once we have received your upload and approved it, we then will send a confirmation email to your partner signifying your JOINT FORCE. No action is needed in response unless there is a problem with the partnership. Your items will automatically split commissions between all parties, even as you progress through the different commission rates. For those of you with items already uploaded and desire to add a partner to your item, please send a support ticket to support[at]mojo-themes.com stating the items title and both parties information. We will be sure to add the change manually. In the near future we will be adding the functionality to add/edit partners within the item uploads page under your account. In addition to this, you will be able to add more users per item. We hope this will enable all of you to partner with the best talent you know to create the best work known in the industry. Until then, be sure to email support with any requests or changes that need to take place. We have built this program in complete response from all of the users requests. We look forward to your feedback and uploads as we continue to provide quality premium WordPress themes. Now get out there and make some magic happen! July 12th, 2010 – QUICK UPDATE: We’ve created a centralized location for all of our sellers to connect. Any interested in collaborating with fellow sellers start a discussion on the JOINT FORCES forum.